Is Motorhome Wild Camping in Belgium legal? Our Adventure begins and we go motorhome wild camping in Belgium… which doesn't end as well as we'd hoped. Motorhome wild camping in Belgium – legal or not? So- can you wild camp in a Motorhome in Belgium? We were brave this time and used the self-service check-in lane instead of waiting for an actual human. It was easy peasy- put in your reference, it confirmed your reg and it printed out a car hangar with your train details on it. Much quicker than waiting in some of the longer lines. We had absolutely no idea where we were going to stop for the night. I know, I know- I always suggest you find somewhere in advance for night one, but we had no idea how bad the delays would be on the tunnel for the first weekend of the school holidays, and we had no idea how bad Mr WB's jetlag might be, so we were keeping our options open. We definitely needed to find somewhere with water though as it's not possible to fill up our freshwater tank at our storage place, so we were completely empty. Once through the tunnel, we headed East and ended up in Belgium. The last time we were here was back in April, when we stopped off to experience the incredible Menin Gate ceremony. This time around, it was another flying visit as we passed through. I found a site where you could fill up with water (see the map) and park overnight… but when we got there it just felt ‘off'. I can't explain why; there was nothing bad, sinister or even remotely threatening about the place… but it was a through-route with a lot of people cycling and walking past and we don't really like that when we're trying to sleep. We ALWAYS listen to our guts when we're looking for somewhere to stop for the night, and if one of us isn't happy than we move on, which is what we did this time. Annoyingly, I thought I'd taken photos of it… but I don't have them any more. Luckily, I found another place just down the road- with an even better view! Downside, it was a wild camping spot, which we'd been trying to avoid. 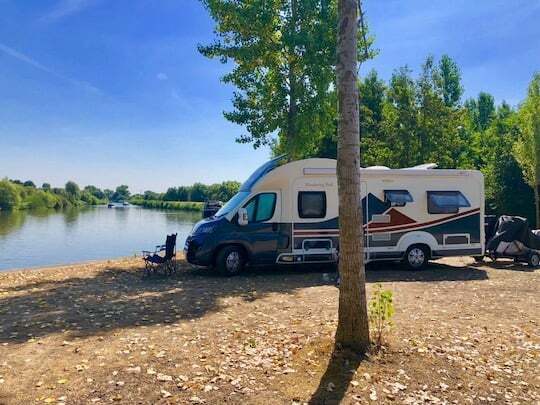 Motorhome wild camping in Belgium- beautiful! I searched for ages to find the rules about wild camping in a Motorhome in Belgium. Some sites say it's ‘strictly illegal', whilst others say it's tolerated. I could not find a single official website which could give me a definitive answer- which I say means don't do it unless you're happy to accept a huge fine! Having said that, when we pulled up at this second camping spot, there were a few other campervans there and it was well out of the way. A guy who lived in the nearest house was out watering his garden- he waved and smiled as we pulled up. It seemed like a friendly place and no-one was shooing us away or warning us of fines. Not that this is a foolproof system!! There is an unspoken rule of wild camping. You don't overstay your welcome. Arrive latish in the day if possible and leave early in the morning (I would say by 10/10.30 at the very latest.) We know this. We've done it lots. Yet the next morning, we decided to have a lie-in, followed by Mr WB having to deal with some work calls (his holiday doesn't start until August!) and before we knew it, it was 1pm and the police were knocking on our door. The officer was very pleasant, but informed us (in excellent English) that we were not allowed to camp here. “No officer” we replied, like naughty schoolchildren. “We're not camping here at all. We just stopped to deal with some phone calls.” I guess technically we weren't camping anymore… we'd already done that! The officer cast a sceptical look over our camping chairs dotted around outside the van (Second rule of wild camping- do NOT put out awning or furniture!) and raised an eyebrow before confirming we would be gone within the hour. We don't know whether it was sheer fluke that a policeman was down the remote road, or whether one of the residents/ people walking past had called to complain. We also don't know whether wild camping is banned in all locations across Belgium, or just that one spot. There were NO signs banning camping/ overnight stops. Heck, there were no signs at all. Still, we had a lovely stay in a beautiful spot and got a great introduction to Belgium. We'd love to explore more of the country- as soon as I can figure out the rules!! In the meantime, I would suggest avoiding all places not specifically marked for motorhome use! It's Day 2 now and we're heading into Holland. Want to save this to read later?